New Palm Beach Currumbin coach Jess Sinclair has been in the role at Salk Oval since only mid-January but has yet to detect any signs of complacency in the playing group. In fact, Sinclair, the former North Melbourne and Fremantle performer, said there appears to be a burning hunger evident among the playing group, in particular the older and wiser heads among them. Events that led to five-season coach Chad Owens switching to VFL club Coburg just before Christmas led to PBC having to search frantically for a replacement for the dual premiership mentor. 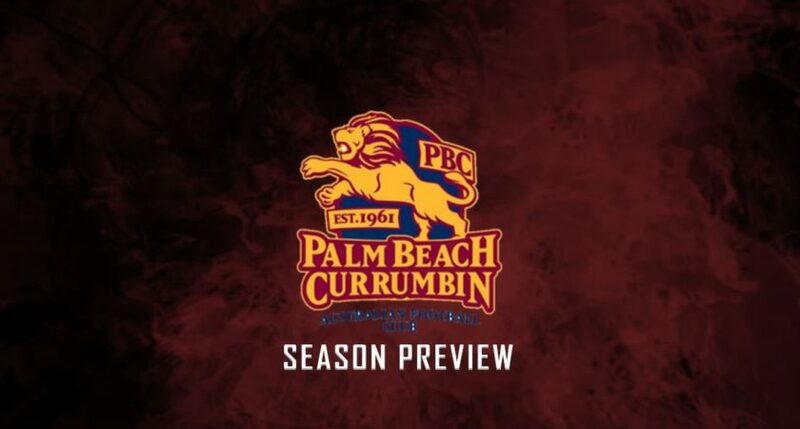 It was a rushed decision to go with Sinclair, but the new top Lion likes what he has seen thus far as PBC go into the opening round against Broadbeach on Saturday. For starters, Sinclair has taken over a group with very few losses from season 2018 when the Lions won back-to-back flags. The main absentees are goalkicking on-baller Jimmy Holland (to Coburg) and young defender Caleb Graham (Gold Coast SUNS). Two other grand final players in Jarryd Douglas and Brock Askey are overseas and will have late starts to the season. But the incomings seem to outweigh the outgoings. Season 2017 star Dylan Troutman, who was stiff not to get the Joe Grant Medal as best on ground in the grand final, is back from Olinda Fedrny Creek in Victoria, bringing with him Ethan Greenall, his half-brother. Greenall’s father Andy was a star at Coolangatta and Southport in the early 2000s. Also now on PBC’s books are Rayne Harris (Knox), Glenn Screech (Southport) and Matt Fife (Donvale). Fife may not be ready for action for a month or so but he can play. Now into his 30s, Fife was runner-up to one Dayne Zorko in Broadbeach’s 2009 best and fairest count while Screech is a hard-nosed defender who won two flags with Southport. Sinclair said his main brief is to coach players to get better and better. “And what will be towards the end of the season will be,” he said. Given this year’s version of the Lions is chasing the honour of bringing home PBC’s first hat-trick of premierships. With eight flags and 16 runners-up finishes since 1961, the Lions have gone close to the hat-trick only once – in 1999 (GCAFL) and 2000 (AFGLSQ). They finished third in 2001. So, does Sinclair feel the pressure coming into a club going for a place in history by winning three in a row? “I do feel a little bit,” Sinclair confessed. “People have said coming off two premierships wins the only way to go is to go down, but that’s not true. “When I first came to training I could see there was a really solid group. The way they cracked in said to me they’re hungry again and I think that has been translated to the way we’ve gone about in our pre-season games. “There’s always that hunger there and if the guys want to learn and develop there’s no reason why we can’t have all the success in the world. Newly appointed captain, Stephen Thyne, who was co-skipper with Jesse Derrick for the second half of 2018, said Sinclair has fitted in nicely at Salk Oval. Thynne said Sinclair has not tried to change things drastically, just added some tinkering. “He has been good. He has brought renewed energy to the group with a new look at things,” Thynne said. The keyword is hunger and Thynne said there has not been any loss of appetite in that area. There has not been a hint of everybody sitting back content with having back-to-back titles under their belt. “It’s still there (hunger),” Thynne said. “It has been really competitive and the hunger’s driven by the older players. Thynne said any number of PBC’s younger brigade are set to emerge as top-liners but feels Zac Harrison is set for a seriously big season after he emerged from the pack in 2018. Gains: Dylan Troutman (Olinda Ferny Creek), Ethan Greenall (Olinda Ferny Creek), Rayne Harris (Knox), Glenn Screech (Southport), Matt Fife (Donvale). Losses: Jimmy Holland (Coburg), Jarryd Douglas (overseas), Caleb Graham (Gold Coast Suns), Dale Neuhaus (stepped down). Played 18 (incl. finals). Won 16, lost 2. Points for (regular season) 1685, points against 1036 (percentage 162.64). Finished premiers. Best and fairest: Thomas Thynne.